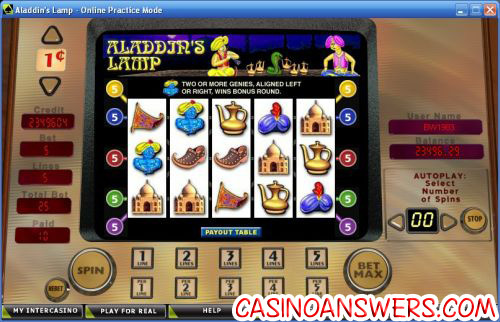 Aladdins Lamp Video Slot Guide & Review - Casino Answers! 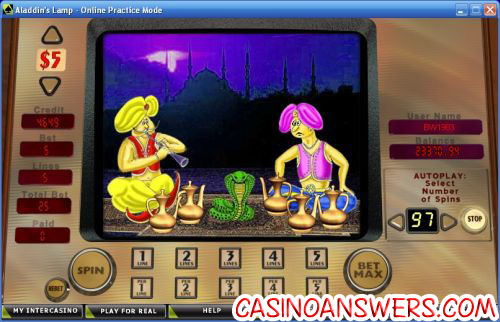 Aladdin’s Lamp is a 5-reel, 5-line classic slot machine developed by Cryptologic, featuring a bonus game. You can play the Aladdin’s Lamp slot machine at VIP Casino and Casino Joy. Bets on the Aladdin’s Lamp slot machine are $0.01, $0.05, $0.10, $0.25, $1, $2 and $5. You can play 1-5 lines on each spin in Aladdin’s Lamp. The lowest bet you can make is a penny, while the highest total bet you can make on Aladdin’s Lamp is $25 per spin. An autoplay mode is available to play up to 99 spins at a time. To play all 5 lines on the Aladdin’s Lamp classic slot, hit the “Bet Max” button, or for other wagers, hit the “Spin” button. The Cobra symbol is the highest paying symbol on the Aladdin’s Lamp online slot machine. If you hit 5 Cobra symbols on a selected payline, you will win the 5000 coin top jackpot. The second highest paying symbol in Aladdin’s Lamp is the Sword symbol, which pays up to 2500 coins. You can win one of these great payouts at VIP Casino! There are 8 winning combinations on the Aladdin’s Lamp classic slot machine. The full payout schedule is as follows (2/3/4/5 symbol payouts in parenthesis): Turban (1/2/10/50), Lamp (1/2/12/100), Castle (1/3/20/250), Shoe (2/10/100/300), Magic Carpet (3/15/200/500), Pottery (4/25/250/1000), Sword (5/50/500/2500) and Cobra (10/100/1000/5000). Aladdin’s Lamp lacks in presentation, as the slot machine is a little old by today’s standards, but it does offer some good payouts in addition to the bonus game. To try it out for yourself, sign up and make a deposit at VIP Casino! Are USA players able to play the Aladdins Lamp slot machine? Players from the United States are unable to play the Aladdin’s Lamp classic slot game at Cryptologic online casinos. Fortunately, there is a video slot called Aladdin’s Wishes that you can play at USA-friendly RTG casinos such as Slots Oasis Casino. You can also read our Slots Oasis Casino Review. Is there a Flash game of the Aladdin’s Lamp traditional slot machine available? You can play a Flash game of Aladdin’s Lamp for real money at either VIP Flash Casino and Casino Joy’s Instant Play Casino. If you experience difficulties with the Flash slot game, make sure you have the latest version of Adobe Flash Player installed on your computer. Is there an Aladdin flash game?